The worlds two biggest religions celebrate the faith of the same man. A guy named Abraham. Abraham was so faithful that he took his own son strapped him to an altar and plunged a knife toward his chest. Now the believers will tell you no harm was done because an angel stopped Abraham before it was too late. I kind of doubt this is true because I can’t imagine that the kid didn’t feel traumatized after such an event, but even then. So what? So what if God stopped him before it was too late? How does that make what Abraham did ok? Let’s put this story in another context to see what I mean. Suppose a powerful leader demands a person kill his kid as a sign of faith in thier leadership. Go ahead, pick one. Hitler? Obama? Al Capone? Is a faithful submission to such a demand ok in that case? The God of Abraham is presumably a really powerful person and can kill others pretty easily. So why does he need someone else to do it for him? And why celebrate that act as something only the most faithful person would do? Why make that a model to strive for? 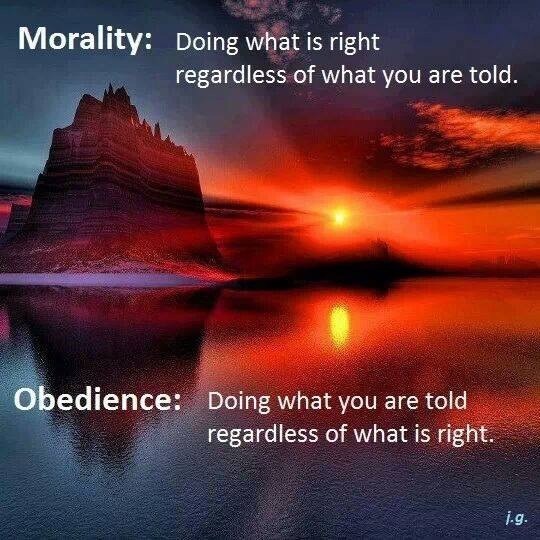 I think religion f%#ks up a person’s sense of morality and the story of Abraham is a prime example. 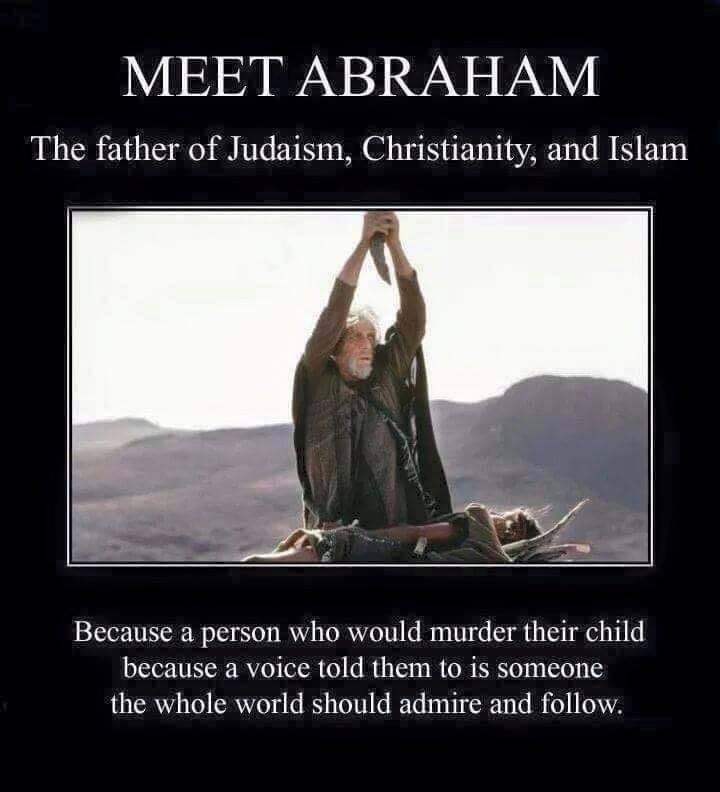 In any other setting Abraham would be considered a coward. A man too chicken to do what is right. To concerned with saving his own eternal skin to consider the morality of tying his own son to a rock and attempting to kill him. This is a guy trying to ‘win favor’ with the mob boss by any means necessary. But religions call it ‘faith’ and celebrate it. The more I contemplate this the more I think deep down the religious are cowards. They seek out the biggest wolf in the pack and fight others in his name and for his protection. We see this all the time in the animal kingdom. I have a couple of pet dogs that are more than willing to take on others for the protection and home I give them. Given mammals share a lot of DNA I can understand the genetics that reinforce this behavior in humanity. But isn’t being human about going beyond our animal instincts? Shouldn’t we celebrate standing up to oppression rather that accepting it? I think it’s high time we celebrated people like Jack Harper more than cowards like Abraham. In short, we should do what is right and let the consequence follow. Even if you fear the consequence is eternal damnation. True courage is doing what is right even when you have everything to lose. There is nothing special about Abraham.Imho.Just another made up story to envoke faith or something not sure what really.Funny Issac’s feelings are never mention after this event.Man I am sure he needed some major councelling after that.Or what if God’s timing for the stop order was just a little out of synch.Oh right he’s God he doesnt make mistakes.Right?. The foolish and guilable will always believe what they want and see what they want to see. I’ve been thinking lately that this story could have been an example of a technique called a ‘magician’s force’, where no matter what Abraham did God would have praised him. What a different book the Bible would be then, eh? That would be a person to emulate!! Abraham walked and talked with Yahweh for years before Isaac was even born. Abraham’s “test of faith” didn’t consist of him pledging to be obedient due to some vague, ambiguous sense of emotional elevation conjured through pondering and reflecting upon his beliefs. It was him cowering in fear of being destroyed by Yahweh, presumably by the most powerful being in the universe. Abraham saw what allegedly happened to Sodom and Gomorrah and to Lot’s wife. Presumably, he had a clear understanding of what might befall him were he to disobey Yahweh. So, faithers, tell me again what was so special about Abraham’s “test of faith”.